Breakers swim team took to the pool this past Friday to raise money for the annual YMCA Strong Kids Campaign. The swimmers began the night with what seemed to be a regular practice and slowly turned into a great event for both swimmers and parents alike! Events included duck races, parent and child relays, as well as a great pizza party. Swimmers took to the their communities for the past weeks asking for donations for every lap that they swam. “This event is a great team builder for the swim team and a great way for all involved to have a spectacular night” stated Jen, a swim mom. All in all the event went off without a hitch for a great night of fun and all done for a great cause. Yesterday my youth running club and I made history at the XL Center by running in what is said to be the only indoor half-marathon and marathon relay in the nation and potentially the world! I only found out about the event a couple of days ago when Tim,a member of our Wellness staff and one of our personal trainers, told me about it. It sounded like a neat idea and I thought it would be a great opportunity to support the XL Center, and also support the charity for which the race was raising money for — Veterans Inc. I had such a great response from my running club to take part in the event, I was able to form 2 teams of 5 runners. Each runner was responsible for running a leg of the 26.2 mile course. They had an absolute BLAST! They didn’t care what their times were, some of them just jumped in and ran a few laps with their friends when they got bored of waiting for their turn to run. They cheered each other on and just had a great time. The best part for them was just being with their friends and doing something that they know not everyone has the opportunity to do. On the way home, one of the girls who ran that day, but hadn’t been coming for a while, said to me how glad she was that she came. She said she hadn’t been coming to practice because she hadn’t been running, and knew she would be slower than the group. She wanted to come today because it sounded so fun. She said she realized that it wasn’t about the running today, it was about being with her friends and having fun; isn’t that what it should be about? I couldn’t have said it better myself. P.S Seeing themselves on the NBC news at 6 and 11 o’clock wasn’t a bad perk either!! The West Hartford YMCA has begun their 2013 Basketball league this past weekend. Lets go going back a week prior to opening day, where the WH YMCA had hosted a coaches meeting and clinic at the St. Thomas Seminary. The coaches meeting consisted of the schedule of how each week was to play out, some FAQ’s about roster, schedule of games, where each division plays, and the best part of the meeting was the coaches clinic that was run by two past volunteer coaches from last season, a father and son. The father has had more than 40 years as a former associate athletic director, tennis coach and physical education instructor at the University of Hartford. And the son, who is again coaching multiple teams this season for his kids, but also the head basketball coach and athletic director at Grace Academy Middle School in Hartford. The two of them have put together a series of drills and skills clinic that they have use for their own teams in the past. The clinic consisted of ball handling skills, combo of dribbling, passing and shooting drills, and defensive drills for ages 3 up to 6th grade. The coaches clinic was a success and had a great turnout! The volunteer coaches then had their brains in gear for the season ahead and were ready for their first practices with their teams. Opening day came along, everyone was so excited to meet their teams and coaches, and receive their team t-shirts. Coaches had then began to conduct their practices, multiples coaches were using the drills from the coaches clinic. The smiling faces of kids and their families and the amount of excitement and joy of playing basketball was an amazing feeling for both the community and the YMCA staff. This has proved that at the YMCA helps build relationship and connect people in many ways. The coaches meeting brought people together with the same passion of basketball and giving back to the community. I am excited to continue building my own relationships with each and every coach, the participants and their families. Wheeler Tigersharks and Special Guest for a GREAT Cause! 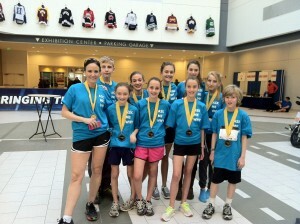 On Sunday, January 6, Coach Rachel and three Wheeler Tigershark team swimmers took part in the BREAKout! 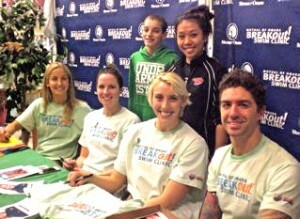 Swim Clinic where all proceeds went to help the victims and families of the December 14 Sandy Hook tragedy. The clinic featured Olympic gold medalist swimmers and Madison Kennedy – a CT native training for the next Olympics and a past Wheeler Tigershark swimmer who still holds records for our team today! It was a great experience for a great cause! We Not Only Build and Strengthen Relationships; We Save Them Too! Although I know that building strong relationships is one of the pillars of the YMCA; I was recently told that we do a pretty good job in helping to preserve them too! A couple of days ago, one of our new members came up to speak to me at the membership desk. She only started coming to the Downtown Y about a week ago, but she said how much she was enjoying the workouts, and how good she feels after she completes them. She admitted how hard it is at times to get motivated to come and exercise after a long day at work. However, she said, “You know, since I’ve been coming to the gym, I’m so much calmer, even my husband has noticed how much more relaxed I am!” She said how she used to come home from work stressed out from her day, and was often short tempered with her family and tired beyond belief. Now, she comes home relaxed and ready to hit the ground running! In the crazy, busy lives that we all seem to be living at the moment, it is often hard to carve out the time to exercise and look after ourselves in the way that we should. We always seem to put ourselves last in the scheme of things. However, I know from my own experience that when I do put my own mental and physical health as a priority in my life, everything else in my life is enhanced. That is the message I try to share with my members every day. Wanda Johnson is one of our newest members here at the Wilson Gray. After sitting and chatting for a bit I came to realize she had a very special story. Wanda is cancer survivor. I asked why she chose to come to the YMCA instead of all others gyms the area. She felt that it was important to get fit and stay healthy for her family and friends in order to continue to motivate those around her. She has found strength through them, so it is only right for her to be there for them when they are in need of her. 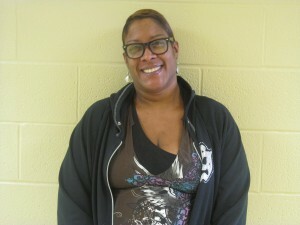 She also took into consideration how friendly and personable the Y staff was compared to other gym staffs. As soon as she walked into the building, she felt the family atmosphere. It also helped that her cousin is on the Y staff and her nephews often workout here. It was great to see a key example of how the YMCA helps build strong, commmunities and families! I started attending the Tai Chi class taught by Lucky in October 2012. I find the class challenging but not disouraging. I enjoy the breathing exercises at the beginning of class and have started to benefit by the blancing portion of class. The slow and gentle movements of the postures are very easy on the joints and I am gaining greater flexibility. I chose this class to help lessen every day stress and as a result my almost daily migraine headaches are not as severe. Lucky is an extremely patient instructor and is always willing to review previous sessions with the class. I enjoy Tai Chi and will hopefully gain long-term health benefits by continuing to attend classes. Thank you Lucky, for offering such a wonderful experience for the staff and members of the Indian Valley Family YMCA! Many days I feel like all I ever get are emails…send me this, do this, and do that!!!! Most are your standard “work” emails. Then out of the blue you get an email that just makes your day and you can’t wait to share it with everyone! I received a wonderful thank you email from a mother whose 4-year-old son attends our Rockville Childcare Center. Her son is Autistic and has been with us now since September. The staff who work with him every day truly do everything they can to ensure he is successful at the Y. Below is the wonderful email she sent that truly touched us all! I just wanted to let you know how much I whole heartedly appreciate all that the staff at the YMCA do to ensure Max receives such extraordinary care. Ms. Jenn even came back to the center after her scheduled time just to help with one of his behaviors within the past week. She has a natural understanding of Max and always goes above and beyond for both myself and Max. I appreciate that I never feel rushed when speaking with the teachers at the YMCA. I can feel the dedication and genuine concern of the Role Models that work with Max every day. I truly believe Max’s success is a direct reflection of the guidance he is receiving at the YMCA in Rockville.